When it comes to Sushmita Sen, age is, in fact, just a number. The woman radiates from within, and the secret to her glow, TBH, is not a secret. 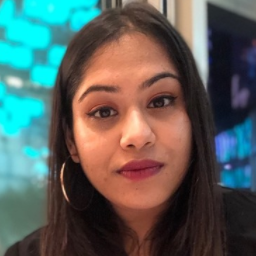 It is common knowledge that the former Miss Universe, Bollywood veteran and 'Dilbar Dilbar' OG is a fitness fanatic. The woman works out and has an insanely toned body. Remember when she posted this smokin' selfie? Working out is crucial to achieving a fit body, but so is consuming a wholesome, nutritious diet. We always assumed she loved her greens but yesterday, Sushmita gave us solid proof - and it's a little hard to 'stomach'. 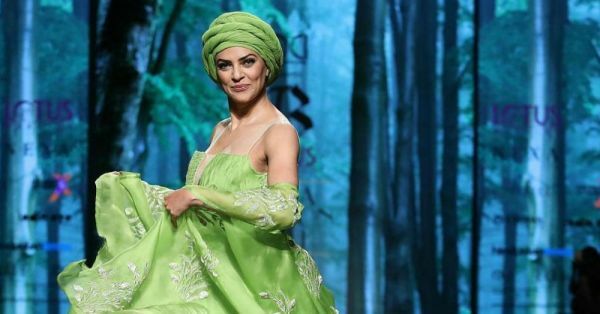 The actress and activist walked the ramp for designers Bhumika and Jyoti in a grassy green ensemble, and it wouldn't be wrong to call it a catastrophe. I'm being polite here. We would have thought Sushmita Sen knows better than to wear something that unflattering. The outfit consisted of a green strapless asymmetric dress with an overload of frills and off-key tailoring. The dress was layered with a sheer embroidered kimono, which we quite like... but thanks to the badly draped turban that covered most of her head, the salad green outfit could not, unfortunately, be salvaged. May it rest in peace. If you think I'm being too harsh, I beg to differ. I mean, you know the body she has underneath the cabbage camouflage, don't you? We love oversized garments but this designer piece is neither here nor there. It is clear that the cabbage-like look does not do justice to Sushmita Sen's hard-earned body. For me, that's criminal, HBU? This isn't the first and last sartorial disaster, and there's more good than bad amongst what we get to witness on a daily basis. However, it is important to call out the bad because isn't that what fashion is all about? Trends will come and go but the bottom line is that no matter what you wear, it should accentuate your strengths. Am I right?